Every wardrobe needs go-to black trousers. Flat fronted with twin rear pockets, these Moss Esq. trousers are generously cut for a regular fit and come half-lined for comfort, making them a great choice for everyday wear. Feel comfortable and fit really well. Good suit and reasonable price. Extreamly good value and nice suit for use. Ironed by an amateur and thus poorly presented- should have been picked up QA team. Excellent fit and colour as expected. I'm 6'8 and these trousers fit me. That's a rare find. It was good quality and good value for money. Need the suit that night, and no problem, also fitted well. Frank needed a different size trouser and a different size jacket. Great quality, fitting and cutting. The whole online experience was easy. The suits are bought are great and we’re good value for my money. Excellent cut, good value for money. Decent suit for the price. Personally I’d have preferred one of the better quality suits, but this was the only black suit available in my size. That said, it’s pretty good, and definitely good value. Bought with the suit jacket so got a good suit for at least 50% I would expect to pay. Maybe I should have purchased two pairs. These are good quality trousers. Excellent fit. Good size. Good to wear on their own with shirt only. Great fitted perfect ........... .. . . The trousers were excellent. Length and waist were perfect fit. Nice fit and good quality material. Perfect fit & great quality. Why is Feefo making it so damn difficult to leave feed back?! FFS. Not the right size and I have ordered an exchange which will take up to 2 weeks! Perfect and quality item for reasonable price. Fits my waist perfectly. Didn't have my length but my wife shortened them for me. Now they are perfect. Ditto, but my legs are extra short, 27.5'', hence need to alter the S short length trousers, could do with an XS option. It was ok but didnt fit . Polite, helpful, not pushy to get a sale - thats what I like, my demands were forefront. In a nutshell, totally excellent service. Excellent fit and well made for the price point. Perfect fit. Exactly as the salesperson said it would be. Material feels so smooth, and comfortable. Smart and well made. Excellent deal. Great fit and price with fast delivery. Previous purchases made selection easier. Good fit all round but trousers cut too short for 30 short inside leg. You are fantastic! I love your products. Great quality & service. Very pleased! Perfect fit. Good price. Quick delivery. Exactly what I needed, good fit. Perfect fit - could not be better. Great price, good fabric, great fit. Great fit good quality material. Excellent fitting. Good value for money. Like the jacket, it suita multiple occasions. They had my size, fortunately. Fine. The trousers were a reasonable quality. Returned the trousers as they did not fit and immediate exchange without hesitation and great service and delivery. Great value and fit .Will always look at Moss Bros as a first choice for a suit. Excellent quality for a £99 suit. Can't complain. I usually have a problem finding trousers that fit my thicker rugby player thighs, and my regular sized waist, so I'm very happy with how these fit! A good trouser perfect for everyday wear. Extremely good quality for money. Good offer. Combination of suit, two pair of trousers and two shirts. Worked with the suit jacket I had just bought! Same comment as suit jacket. Good quality trousers, however your shop did not carry a wide range of trousers in this size - some short leg trousers which did not require alteration would have been nice. Very smart trousers. Sizing was just right for my husband. Just right for work. Excellent quality and well made. Not 32L. Tag says 32L and invoice says 32L but I could fit in the trousers twice. They will be heading back soon! they are fine they fit, are not very comfortable but they work. 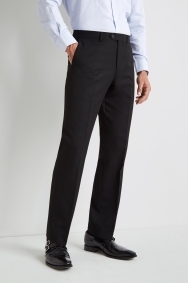 Comfy and easy to move in, will be happily and easily walking down the aisle in these high quality trousers. The finishing of the suit is top notch, shopped with Moss Bros before and I'm not disappointed. Sort your sizes out. You can't have the online size showing 40 when your salesman in store says your a 36. How do you manage to get it so wrong? Great fit, very good quality. Good quality product. Good material. Being briader in hip and leg than I should be it was still a good fit. Good quality material, great fitting and good value for money. Ok. For work. Not great as fit is poor. These trousers need to be available to buy with Moss Esq suit jackets for people do any amount of sport to have shoulders, small waist and big thighs. Legs shortened very quickly for me. very Helpful staff good work keep it up. As above and nothing more I can add. Good looking suit but the price went up dramatically in 2 weeks as I had to reorder due to my original order being a size too big. Good fit. Good Value. Easy to find what I wanted online and then get it in store. A nice pair of trousers .Perfect fit. Excellent quality and matched with jacket a excellent suit. Again, Rochelle guided me through diving and offered superb service, perfect sizing and also listened I needed a little bigger as sat in wheelchair. I believe Rochelle learnt from this exoerience. Very professional, deserves recognition. Perfect! Love my new suit! Give Dave and Davina a pay rise in derby!! Just exactly what is required. Size is on point. Fitted very well. Good value. Very comfortable fit and a great cut. size as expected and very comfortable. look great with the suit. Too baggy. Why do I need to expand my comment ? Finally I could find the appropriate size for me in stock only in Moss Bross. Thank you. Item was as described on the web site and the quality was as expected. Trousers that again go with the jacket making for a super appearance and comfortable fit. black trousers that fit great! A little tight round the waist compared to other brands, but still fit well , good length. Not great but you get what you pay for. Good value. Very stylish at a competitive price. Excellent bargain! Good fitting and very helpful salesman. 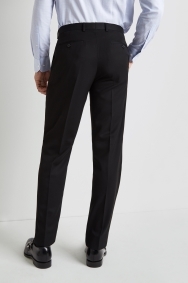 Having a large waist, these trousers fit snugly, and are just the right length. Great fit. Great value. Would definitely buy from again and recommend. This product was Perfect. Fits as expected, looks as expected. Nice suit, nice price, as bought together with jacket. Good quality and comfortable fit. Only had the one pair in my size so couldn;t take advantage of the offer on the second pair. Very good. Love the product. The quality is good however having bought 3 trousers in the same brand they fit different especially for I a man with larger thighs who needs the right fit. Item purchased is a gift but is a repeat of item (trousers for suit) previously bought and very happy with fit and wear. Thank You! Nice item to complement the waistcoat perfectly. Jacket was a perfect fit. The trousers came up smaller than expected. Still too long so needed shortening but good trousers nonetheless. Fitted perfectly having followed measuring instructions carefully. An excellent, value for money pair of trousers. Excellent price for a great trouser. I wanted more seat room - return was easy, free collection and money refunded in two days. Good fit, with the different lengths available it makes finding the right fit easy. Good quality suit and shirts at a very good price. The service I received was very good. The one pair that did arrive are ok, it is their customer service that is deplorable. Good quality. Bought these trousers for my son for school. the size fitting chart online is a total waste of time as there is a difference of about 4 inches in the sizes listed in the tables and the actual size of the item when delivered. I had to change the suit in store which added a 50 mile round trip to my purchase. it makes the online shop a complete waste of time. The trouser suit my needs I like it, thanks! The regular fit seem to be Slim Fit! are you sure you packed the correct items? the Navy has more room in the thighs! Of average quality, suitable for the use.